1. The well-written, accessible, first-person personal account of hoarding behavior. 2. The insight into the reasons why people accumulate items. Like most people, when I think of hoarding, the images that come to mind are the horrific scenes of uninhabitable homes that enter our living rooms during Sweeps Week. We watch these TV tales in the same way that we slow down for multiple-vehicle pileups on the Beltway. A couple of years ago, in an episode titled “Inside the Secret Lives of Hoarders,” Oprah Winfrey visited a Rockville couple whose 3,000-square-foot home was overflowing with 75 tons of garbage. I went looking for the clips the other day on Oprah’s Web site, and the page about the show shouted, “Uncover what’s behind a hoarder’s closed doors!” I felt my stomach turn. The exclamation point, to me, screamed: “Freak show here. Step right up.” For many Americans, these are hoarders, no further details needed. But as I now know, that’s not the whole story. Collectors likely share that same belief. That because they aren’t covered in garbage, that they aren’t hoarders. Michael talked about how some hoarders had seemingly clean houses, only to have hundreds of boxes filling attics and basements. The contents of these boxes are secondary – why are they there? All of the stuff I pile up is a sort of second body, my twin. 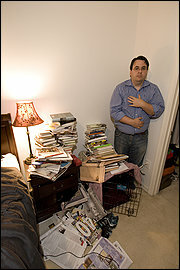 I am Michael Rosenwald, and those piles — the books, magazines, fountain pens, inks, newspapers, everything — are also me. The more I have of it, the more I am me. This entry was posted on Monday, June 14th, 2010 and is filed under Philosophy, Sociology, UofM News. You can follow any responses to this entry through RSS 2.0. You can skip to the end and leave a response. Pinging is currently not allowed. As a general rule I move every 3 years or so, and I am VERY limited in what I take, thankfully I am a bit of a minimalist… I could honestly fit every item I care about in the back of a pickup truck. My position is extreme but I’m of the mind that all forms of collecting are atypical behavior, though I’ll stop short of saying dysfunctional behavior. And I’m a collector myself. Also, like most human behaviors, there may be multiple motivations behind it. One person might collect out of nostalgia (trying to recapture their youth) while another person might collect because of mild OCD, that is, because they find collecting to be pleasurable. Yes, I just said that finding collecting pleasurable is akin to having OCD. What is collecting? It’s the act of accumulating stuff so you have it. Many toy collectors justify toy collecting by saying that they think the toys they collect look cool (or are fun to play with, although how an adult toy collector can play with the toys they collect has always escaped me). Unfortunately we know that many toy collectors store most of their collection in boxes never to be looked at. Or most likely, they buy toys that they don’t think look cool because they need the toy to complete a set. Which brings us full circle – they accumulate stuff simply for the act of accumulating stuff; to “complete” their set. 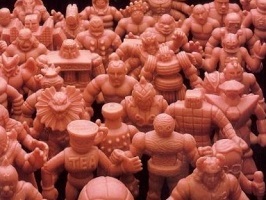 In this sense, collecting is goal directed: Im trying to complete a set of toys. Thus I will hunt for and buy the toys I need until I complete the set. This seems logical. However, often the time and money spent on this task, and the resulting pile of toys stuffed away in boxes, not to mention the competition driven behaviors toward other collectors, are not logical at all. In conclusion, there is a fine line between hoarding and collecting. Collecting can easily become a negative factor in ones life and often does. Thus, surprisingly, toy collecting is a hobby that must be done with a lot of reflection and introspection. Toy collecting done without these things typically leads to burnout or worse.